Learn how to healthy snacking tips with these nutritious, simple options. Portion size is important so try to keep your portion size within reason. You can prepare your snacks ahead of time with a specific portion size so that you don’t overeat. Eat slowly to avoid overeating because you feel ravenous. Give your stomach a chance to let you know it is full before you put too much food in it. Chew your food well and savor the flavor. Count your calories, especially when snacking because this is when we usually eat thoughtlessly. Healthy snacking tips advocate fresh foods that are not processed and filled with calories, sugar, salt and unhealthy ingredients. To prepare snacks in advance, cut up fruits and vegetables as finger food that you can just pop in your mouth while you are working, traveling, etc. Carrots, olives, grape tomatoes, celery, apples, tangerine, pears, hummus, cheeses, and a small piece of dark chocolate are all good choices. You can add beans, seeds, nuts, or chicken to the mix for some protein. A small cup of yogurt or cottage cheese is another excellent protein choice. Try to have a healthy combination of protein, fats and carbohydrates. Smart snacking for adults should include drinking water. Another excellent choice is to drink half of a protein shake to fill you up and keep you satisfied until your next meal. Try to keep your total snacks for the day under 200 calories, especially if you are not very active. Smart snacking for adults also includes avoiding junk foods like cakes, candy, chips, cookies and ice cream. Instead, try some of the following items: kale chips, nuts, grapes, cheese, apples, rice cakes, bananas, strawberries, yogurt, green beans, tuna, pop corn and hard-boiled eggs. The U.S. Department of Agriculture reports that snacking among adult Americans has increased over time and currently equals about 586 calories for men and 421 calories for women, which is over the recommended amount. It is true that working at a desk usually means that you will snack more, so you really have to be vigilant about what you put into your mouth. You can learn how to snack healthy at work by following a few simple rules. If your office has vending machines that contain processed snacks, avoid them like the plague. To steer clear of mindless snacking at work make sure you eat a good breakfast that will keep you feeling full. Prepare your snacks before you go to work and put them in plastic baggies with the right portion size in each. You can just have an orange, banana or apple if you like, or cut up some fruit, veggies, nuts or cheese as finger foods and dip them in hummus or peanut butter. A cup of yogurt, cottage cheese or soup is also a good choice while you are working at your desk. 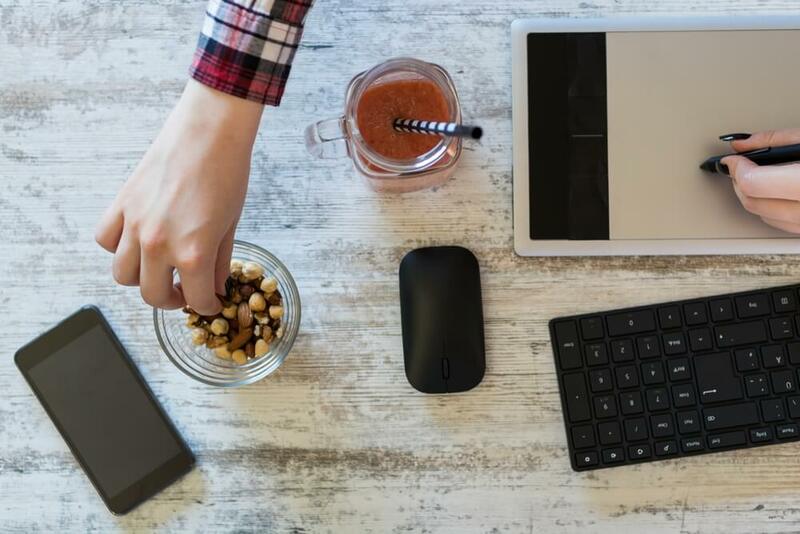 How to snack healthy at work means watching your portion size and caloric intake too. Healthy snacking tips should always include developing smart eating habits. This means consuming more vegetables and fruit, whole grains, dairy, lean meats and poultry, beans, and nuts. Healthy snacking tips means living a lifestyle based on knowledge and self-control. When snacking, keep your portion size within reason and count calories, and you should be able to maintain a healthy weight and body.